How do I get Eclipse to resolve classes generated with Maven 2? I'm using Google Protocol Buffers to generate some Java classes for my project. Using Maven 2 and its "antrun" plugin, these classes are freshly generated before compile, output to target/generated-sources and put on the classpath during the build. So building the project from the POM is no problem. However, Eclipse doesn't know how to resolve the generated class, because the folder it's in doesn't seem to be on the IDE's classpath during development. I'm using m2eclipse and have it manage dependencies for me, so I had expected Maven to take care of this. How can I get IDE support (code completion etc.) for the generated code? m2eclipse doesn't support this. 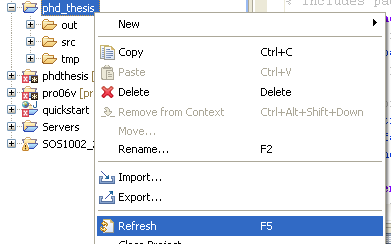 You must manually add the folder target/generated-sources as a source folder. When you tell m2eclipse to "Update Project Configuration", this will be overwritten and you have to restore it. Also, make sure that Eclipse looks for changes in the workspace. There might be some issues, though. Eventually, you'll run into errors that some class can't be compiled because some other class can't be resolved. Code completion will work, though. The root cause of this issue is that Eclipse gets confused when Maven changes class files in target. To solve this, you must tell Eclipse to compile to a different place than Maven. The second step might not be necessary, if your eclipse installation has installed the "org.eclipse.m2e.discovery.lifecyclemapping.buildhelper.xml" plugin. This plugin is available via Window -> Preferences -> Maven -> Discovery. Currently, that does not work here at Eclipse Kepler, therefore, I fetched the JAR (linked from the xml shown in the Catalog URL) and extracted the fragments from org.eclipse.m2e.discovery.lifecyclemapping.buildhelper.xml by hand. What you should see in your project explorer is a container named "Maven Dependencies" in place of the usual "Referenced libraries". This means m2eclipse is managing your build path. In my case, to achieve this, I checked "Include Modules" and unchecked "Skip Maven compiler plugin when processing resources" on the "Maven" section of Project->Properties. Personally I resolved this problem by setting up the generated classes as a seperate project and made it a dependency in my main (non-generated) project. I was using wsdl2java to generate webservice classes so the "source" in my sub-project was the wdsl and xsds. Worked well even when the wsdl was changing regularly. Did you try to refresh the Eclipse project? When an external tool generate new files or updates old ones, Eclipse will not be able to detect the change until the next request. Typically I would add the m2e lifecycle-mapping plugin to the pom.xml file as described in @koppor's answer. However adding per-eclipse code to my pom.xml files is not an option at work which is mostly an IntelliJ shop. My solution first adds the build-helper-maven-plugin to the pom.xml which works fine from the command line but not in eclipse. To generate Java source files from .proto files use Protocol Buffers Plugin which works out-of-the-box in eclipse Oxygen. Not the answer you're looking for? Browse other questions tagged eclipse maven-2 code-generation protocol-buffers or ask your own question. How to wrap an Ant build with Maven?